A scene early on in “La La Land” features our two main characters, walking down a romantically lit street while they look for her car. He can’t stand her and she finds herself miffed at him and his constant attitude, but there is a chemistry there that is undeniable. The man points out that the lights are on, the moon is full, and this perfect romantic setting is wasted on them. They tease each other, the music swells, and soon they are dancing with such energy and joy we are officially rooting for them to get together. The scene evokes the sense of Fred Astaire and Ginger Rogers in how the two interact with each other while the dancing is probably the most iconic I’ve seen since Gene Kelly put down his umbrella and decided to sing in the rain a little bit. It has all the makings of a classic Hollywood scene. The kind of “movie magic” that is captured but once in a blue moon. 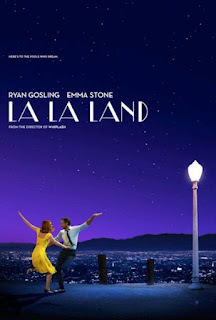 What is notable about this is while the scene is shot to evoke the romance Hollywood used to be known for, the movie takes place in a modern world, with smart phones, high rent costs, and a society that has little love for what made things popular in the first place. They want things to be ‘new’ and ‘current.’ They have lost the magic in their hearts (if it was ever there to begin with). Our lead characters are old souls who are trapped in a world of cynicism and dreams that come with strings attached. That means the movie begins with a dream, falls on hard times, and ends with our leads needing to make compromises in their lives. Oh, but what a joy it all is to experience?! 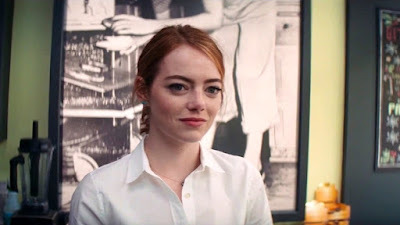 We have Mia (Emma Stone), who works at a coffee shop across an original set piece used in the classic film “Casablanca,” hoping to one day become a glamorous actress that people will remember long after she is gone. She has the look and appears to have the dance skills…but then, so do many other girls in this town. As far as casting agents are concerned, she can be directed but there is nothing special about her. Despite this, she goes through life with a twinkle in her eye and optimism that is infectious to observe. Much more so than Sebastian (Ryan Gosling) has. He is a fan of jazz and hopes to open a jazz club of his own, but none of the clubs who are hiring want him to play his style of music, and he has principles to adhere to. In a way, it’s not difficult to imagine him being a lot like Mia just a few years ago. He’s been in this town longer though, and the reality that what he wants to do and what he needs to do are coming ever so more into conflict with each other, and he’s at the point where he knows he’ll have to make a choice sooner or later. When the two meet they are similar in some ways and different in others (like most couples in this type of film are). They connect so deeply, I believe, because deep down they both have an ideal view of what they would love their lives to be like. She believes it more so than he does at this point in time, but he still believes in the dream just enough to believe it’s obtainable. The joy (and disappointment) comes from watching these two young lovers start a life together and watch their view of what that life is ever so slowly shift over the course of the film. 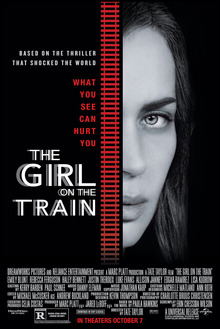 There is a fine line that is being walked throughout this entire movie where the movie has to morph from feel good musical to a more serious drama. The changes happen slowly and subtly, creeping up on the audience in a way that when we realize they are changing, we are beyond a point where anything can be done about it. The seasons change and with them so do the hopes and dreams of the future. The more the future comes up, the more we look at the past as silly dreams we had when we were kids. Yet this is not a cynical movie. It is a largely joyous one with hints of sadness and longing. It acknowledges that times change and so do the people. It knows that the world, which at one point in time seems magical and endless, becomes more grounded later on (literally in the case of this film). The movie was directed by Damien Chazelle, who burst onto the movie scene in a big way a few years ago with “Whiplash,” about an aspiring boy who had dreams of being taught by a masterful teacher, only to discover the teacher was abusive and insane. That he became a willing participant of the abuse showed how much he believed in the dream. 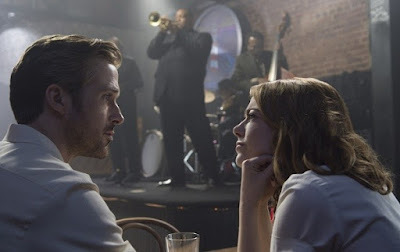 While that was a very different kind of movie, I wonder if it was the blueprint for what we see in “La La Land.” Somewhere in Chazelle’s head is there is a version of “La La Land” where the characters are crushed by reality on a constant basis but so hopefully attached to the dream they just can’t see what is happening around them? Because while this movie is largely a fantasy, reality does come crashing down at one point. By the time anyone realizes it though we have been viewing the world through musical colored glasses this whole time, and we can’t help but wonder where things changed. 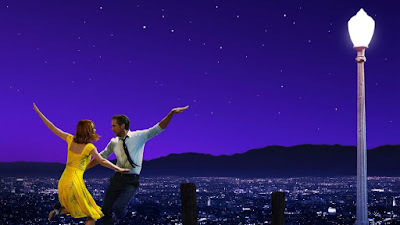 By styling this after the movies of the old days Chazelle has made a movie of undeniable beauty and joy, all while keeping his very adult concerns and disappointments intact without overbearing the audience in angst. It is a masterpiece of film making. “La La Land” is a tribute to how good movies were and how good they’ve become, while perfectly blending the old fashioned film making with modern day sensibilities. It may be the one movie this season that can successfully join the older generation of film lovers with the younger generation and not make either one feel contempt for each other. It is one of the best films of the year and has cemented Damien Chazelle as one of the best directors working in Hollywood after only two films. Course, the same thing happened with Michael Cimino, so hopefully reality won’t sink in on Chazelle too soon. Parents, disappointingly, there is just one use of the f word as well as a vulgar gesture. Otherwise it would be a perfect, old fashioned family film. Recommended for ages 12 and up.